“We will not let go of our current approach until we reach a balanced market,” Saudi oil minister Khalid al-Falih said Monday at a news conference in Riyadh. 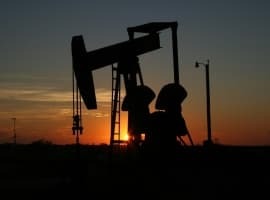 OPEC ended months of speculation last week when it decided to extend its production cuts through the end of 2018, easing concerns that the limits would be lifted before the oil market was ready. But while it put some uncertainty to rest, the next question is what OPEC does when the oil market becomes “balanced”? What is the exit strategy? There isn’t one at the moment, and we can assume OPEC doesn’t know what comes next. But we do know that the group has one key metric in mind: inventories. The target is to bring global oil inventories back down to the five-year average. Oil inventories exploded between 2014 and 2017, hitting record levels that left the world awash in oil. That metric, arguably more than any other, exemplified the glut of supply that led to the crash of prices. It has been a stubborn thing, getting those inventories back down to average levels. 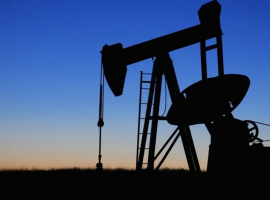 A wave of shale bankruptcies didn’t do it, the vanishing rig count didn’t do it either. That led OPEC and a handful of non-OPEC countries led by Russia to limit their production. But even that deal didn’t seem to be doing the trick at the start of 2017, as inventories remained stuck at elevated levels. The euphoria that followed the announcement of the initial deal gave way to a renewed sense of gloom, which pushed WTI back down into the low-$40s by mid-2017. Related: What’s Holding Back Saudi Vision 2030? However, by the end of summer, the inventories finally started to move. And the declines accelerated in recent months, draining stocks at a rapid clip. 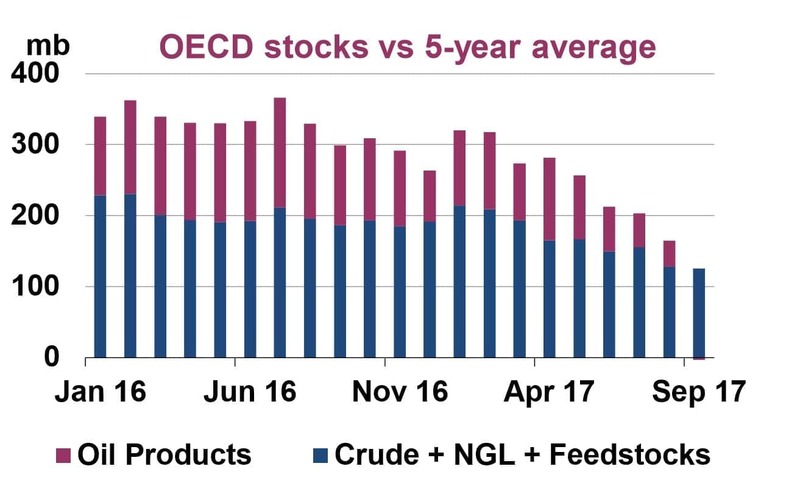 Total crude and refined product inventories in OECD countries (the most visible and transparent metric used) has dropped to only 140 million barrels above the five-year average as of October, cutting the surplus from the start of 2017 by more than half. The big question is when that surplus shrinks to zero. Saudi oil minister Khalid al-Falih warned that winter months tend to bring a dip in demand, which could meant the drawdowns slow for the rest of this year and in the first quarter of 2018. As such, the real progress won’t begin until probably the second quarter. Aiding in OPEC’s effort is that the definition of “average” is constantly changing. With each passing day, the previous five years is increasingly made up of periods of time in which the oil market was in a glut. So, the “average” level for oil inventories today is a lot higher than it was three years ago. That means OPEC could achieve its objective with a lot more ease than if the target level was a fixed figure. Demand is growing strongly, which will help soak up excess barrels as we head into next year. The supply picture is mixed, however. There is rising production in the U.S., Canada, Brazil and some other non-OPEC countries. On the other hand, OPEC countries will keep their output in check, and the inclusion of Nigeria and Libya under the cap will keep supply off the market. And Venezuela’s production will continue to fall. Although estimates vary, the IEA sees the supply surplus returning—in the first quarter of 2018, the energy agency sees a glut of 0.6 mb/d. In other words, inventories could swell for a period of time, although OPEC is not as pessimistic. But both agree that by mid-year, the drawdowns will really pick up pace, and the objective of “balancing” the market will draw near. One caveat, what the various agencies call "Crude oil" is actually Crude + Condensate (C+C), and I suspect that surplus condensate supplies may be obscuring a developing shortage of actual crude oil (generally defined as 45 API gravity and lower crude oil). Interesting development lately is OPEC exports dropping like a rock in Nov. These are the shipments that will hit the USA and other countries in Jan. In 2016, exports were through the roof as OPEC members tried to sell all they could before the deal kicked in, and even after it did, they sold every barrel they could in storage for extra revenue. Early 2018 is setting up to be the complete opposite of early 2017.